I know that New Orleans is a city filled with tons of amazing restaurants, but since we were only there for six days, we couldn't get to all of them. Feel free to berate me in the comments section about places I missed and food I didn't taste. I won't feel bad about it because I ate some of the most delicious food in my life there. My pants were black before this photo was taken. They are now gray. 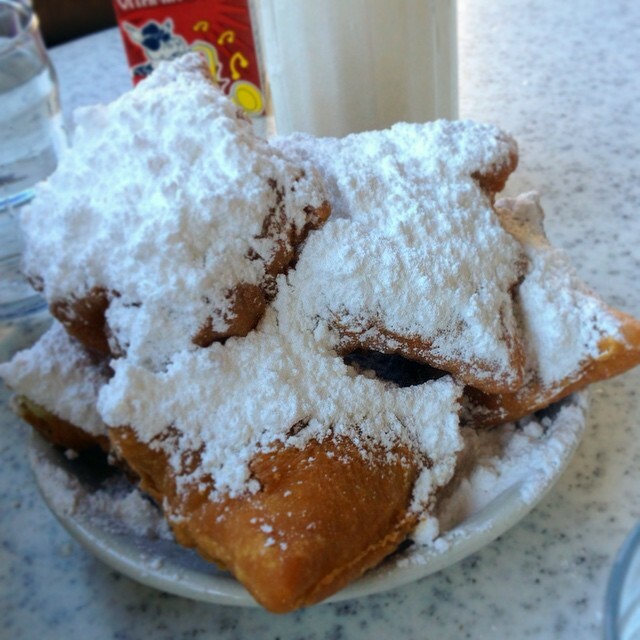 You can't say "New Orleans" without someone mentioning Cafe Du Monde. It's a NOLA institution and for good reason. They only serve one thing (two if you count coffee): beignets, and they do it well. If you're not familiar with these fried pillows of goodness, they're basically French doughnuts covered in mounds of powdered sugar. Can someone start making these here? Thanks. Pro tip: There's almost always a line, but if you can get there before 9 a.m. on a weekday, you'll be fine. We didn't have the patience to take a "before" shot. When we booked our plantation and swamp tour (more on that later), we asked for a seafood recommendation, and without hesitation, we were told to go to Felix's. The waitress at Felix's guided us toward the grilled oysters, and we never looked back. I realized that night that all I need in life are grilled oysters, butter, and parmesan to be happy. Pro tip: Don't waste your stomach room on po' boys. Go straight for the oysters. This hole-in-the-wall bodega serves up some of the best sandwiches (or po' boys) in town. The line is usually out the door and around the block, but somehow we managed to sneak in during off-peak hours. We each ordered different combos, so I can only speak for mine, but the shrimp and crawfish sandwich with cheese and veggies was unbelievable. Like mindblowingly good. I'd compare it to a Philly cheesesteak on steroids. Po' tip: Avoid lunch lines, and go at an off hour. Result of 2 p.m. drinking. Besides beignets, New Orleans is pretty well-known for drinking. We learned that the city's signature drink is the hurricane -- a potent mix of rums and juice. Basically, happiness in a cup. You can get this drink just about everywhere in the city (and take it to go, because New Orleans). What you can't get everywhere are ice cream daiquiris. These alcoholic milkshakes can only be found at the Gazebo Cafe -- an outdoor oasis in the French Quarter filled with live jazz and even livelier booze. We returned here a few times. Pro tip: Pace yourself, duh. Full disclosure: My friend Emily's husband owns and runs Domenica, but that's not why its on this list. The restaurant graces a bunch of "Best of..." lists (for obvious reasons), so when she invited me and my friends to dine there, we jumped at the chance. With Emily's recommendation, we ordered a few appetizers and a bunch of pizzas. I knew the pizzas would be amazing (how could pumpkin, ricotta, caramelized onions, and candied pancetta NOT be? ), but I was not prepared for the awesomeness that was the roasted cauliflower with whipped feta. I'm a casual fan of the off-white vegetable, so I was kind of like "meh" when we ordered it, but DAYUM. The saltiness and creaminess of the cheese paired with the roasted earthiness of the cauliflower was just perfect. Pro tip: Leave room for pasta and dessert! We didn't, and I deeply regret it. While in New Orleans, I also tried gator (which was decent! ), lots of crawfish, and grits. I recommend asking locals for favorite recommendations as these ended up being some of our best meals. I can't wait to go back and gain 7 more lbs (not even kidding).